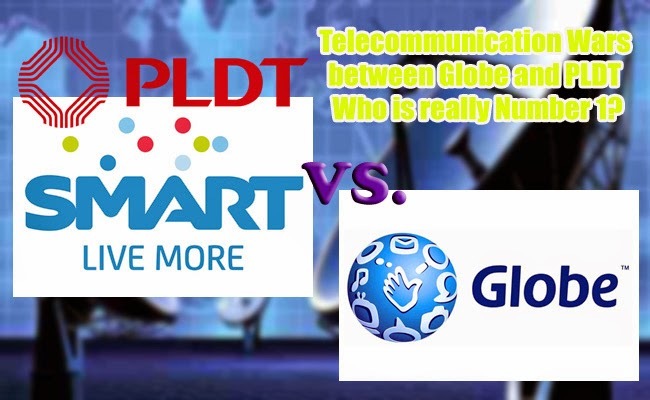 Home Business Globe Telecom PLDT Telecom Smart Communication Smartphone technology Telecommunication Wars between Globe and PLDT Who is really Number 1? Telecommunication Wars between Globe and PLDT Who is really Number 1? Almost everyone has cellphones these days. It may not be a smartphone, but a phone definitely has to have a SIM card to work here in the Philippines, and there are only two telecommunications firms to choose from, Globe Telecom Inc and PLDT ( SMART). These two telco giants are claiming to be the number one communication firm, but which one really is it? In response to Globe’s pronouncement, PLDT spokeperson Ramon Isberto said that PLDT is still undisputed and the number one telco in the country when it comes to mobile service. Smart is still the best mobile service provider in terms of revenues and subscriber based. Before the 2014 ended, Smart even reached over 56.4 million subscribers when it comes to postpaid, broadband, and of course prepaid leading to P92 billion revenue. Isberto also shared that PLDT’s Smart and Sun Cellular dominated the industry with 72.8 million subscribers and combined revenue of P114.5 billion. The number of subscribers clearly shows that PLDT is still number one according to Isberto. PLDT is still undisputed. According to Ernest Cu, the president of Globe Telecom Inc, it is Globe who is the real number one mobile brand in the Philippines. In a press conference held on April 7, after the company’s annual stockholders meeting, Cu shared Globe had even established a firm leadership in the country on various business fronts. Led by Ayala, Globe is said to be number one based its performance on 2014 on its multiple business fronts. He also shared the Globe had been firmly fending off the longtime telco giant PLDT which now owns Sun Cellular, Talk N’ Text and their Smart. Waging war as a challenger against PLDT, Globe ventured on technological, digital and business towards the Globe’s known corporate culture making its financial growth sustainable. Once a challenger, Globe made way to be the leader in telecommunication business including in postpaid and mobile data services, based on consolidated mobile revenue market share since the last quarter of 2013. By 2014, the gap closed in as the prepaid brand TM went head to head with PLDT’s Sun Cellular in consolidated revenue market share. Cu shared that with 32.9%, globe has the highest revenue based on brands while Smart only has 28.2%. Wih the consolidated revenue of P99 billion in 2014, Globe had reached a milestone together with 25% core net profit increase making around P14.5 billion. Cu said that these numbers simply reflects that Globe is steadily holding its place at the top and it will continue on with innovative services and products for the digital lifestyle of the Filipinos. On the other hand, Filipinos are enjoying the competitiveness of these telco giants as they enjoy more mobile services with competitive prices.